GAMERA Star Yoshiro Uchida Joins THE GREAT BUDDHA ARRIVAL! The independent kaiju film THE GREAT BUDDHA ARRIVAL (大仏廻国, Daibutsu Kokaiku) continues to cast familiar actors from the golden age of the genre. The latest addition is Yoshiro Uchida, a former child actor who became world famous for the leading role of Toshio Sakurai in Daiei Studios’ original GAMERA (大怪獣ガメラ, Daikaijū Gamera, 1965). A new promotional teaser trailer has been released for the all-star kaiju film THE GREAT BUDDHA ARRIVAL (大仏廻国, Daibutsu Kokaiku). This latest spot promotes upcoming screenings in France and Germany, the incredible soundtrack artists, and cast members Akira Kubo, Peggy Neal, Toshi Toda, Akira Takarada, Shelley Sweeney and Ippei Ohsako. Ryan Reynolds is Pikachu in the live-action film, POKÉMON DETECTIVE PIKACHU. Photo courtesy of Toho. © 2019 Legendary and Warner Bros.
Entertainment, Inc. All Rights Reserved. © 2019 Pokémon. Toho Co., Ltd. has provided press materials for the Japanese release of POKÉMON DETECTIVE PIKACHU (名探偵ピカチュウ, Meitantei Pikachū). They will open the film in Japan on Friday, May 3; one week ahead of the international release from Warner Bros. Pictures, and the Chinese launch from Legendary East. Mayu Akikawa (Elaiza Ikeda) discovers the curse of “The Ring” has spread online in SADAKO. Kadokawa Pictures has provided SciF Japan with photos from their new J-Horror film, SADAKO (貞子), the latest chapter in THE RING series. The movie is directed by Hideo Nakata, who first brought Japan’s most popular horror franchise to theaters with the smash hit THE RING (リング, Ringu, 1998). Special Thanks to William Winckler, William Winckler Productions, Inc. 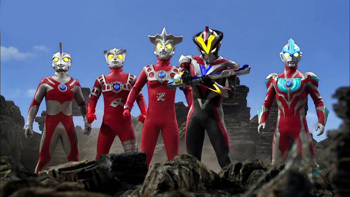 In May of 2006, Tuburaya Productions Co., ltd. launched its own Tsuburaya Productions Channel on YouTube, featuring an eclectic collection of video clips, trailers, short episodes and specials focusing on their “New Generation” Ultraman series. These include ULTRAMAN GINGA, ULTRAMAN ORB, ULTRAMAN X, ULTRAMAN GEED and more. The channel is designed to appeal to English speaking audiences, as well as native Japanese fans. Certain fare is offered with English subtitles. A recent offering is their first English dubbed series, ULTRA FIGHT VICTORY (ウルトラファイトビクトリー, Urutora Faito Bikutorī, 2015). ULTRA FIGHT VICTORY originally aired in 3 minute segments after the show NEW ULTRAMAN RETSUDEN (新ウルトラマン列伝, Shin Urutoraman Retsuden, 2013-16). It was compiled into one 40 minute film for home video release in Japan. In an agreement with William Winckler Productions, the compilation film was dubbed into English along with ULTRAMAN GINGA S THE MOVIE and ULTRAMAN X MOVIE, with the latter two films receiving theatrical distribution in North America. Now on the Tsuburaya Channel, they have split the movie back to it’s original 3-minute segments, serialized with the English language track. A new 3-minute episode comes out each week. Last year, a team of independent filmmakers led by director Hiroto Yokokawa began production on THE GREAT BUDDHA ARRIVAL (大仏廻国, Daibutsu Kokaiku), a remake of a long-lost 1934 film that was quite possibly the first ever daikaiju film from Japan. Yokokawa and his team are now shooting additional scenes to bring THE GREAT BUDDHA ARRIVAL’s running time to feature length for international distribution. These scenes will include some new cast members, including Toho legend Akira Kubo. Across entertainment and pop culture, Japanese monsters continue to feature heavily in conversations of western fans. In 2018, Capcom’s inch-perfect execution of Monster Hunter: World earned them critical acclaim and helped to grow their audience. Now, in 2019, there is a new wave of monsters earning the awe of the western audience. Games created by Japanese developers, released first in Japan, have a lot of major differences when compared to games made for Western audiences. It’s not just the language difference and the need for localization – Japanese narrative styles mean that developers in the east have a different idea of what a plot needs to include to be entertaining. Mayu Akikawa (Elaiza Ikeda) is the latest to face the curse of “The Ring” in the sequel, SADAKO. Photo courtesy of courtesy of Kadokawa Pictures. Kadokawa Pictures has provided SciF Japan with some early information and photos for the J-Horror film, SADAKO (貞子), the latest chapter in THE RING series. The movie is based on the 2016 novel Tide (タイド, Taido) by Koji Suzuki, author of the original Ring (リング, Ringu) and its many sequels. TCAF, The Toronto Comic Arts Festival is proud to announce that acclaimed Japanese manga creator and international horror sensation Junji Ito will participate in TCAF as a Featured Guest and Official Poster Artist of the 2019 Festival, to be held May 11-12, 2019, in Toronto, Canada. Junji Ito is best known for his groundbreaking horror stories including Uzumaki, Gyo, Tomie, and The Enigma of Amigara Fault, and will travel to Toronto in support of his new short story collection Smashed: Junji Ito Story Collection, to be published this April by VIZ Media. Dan Brereton’s Giantkiller comic series returns in a 20th Anniversary Expanded Hardcover Edition. Award-winning comics creator Dan Brereton (Nocturnals) recently launched (and now fully-funded) a new Kickstarter campaign to collect his 1999 giant monster invasion spectacle Giantkiller, into a 20th Anniversary Expanded Hardcover Edition. VIZ Media, LLC, a premier company in the fields of publishing, animation distribution, and global entertainment licensing, announces the home media distribution rights for POKÉMON THE MOVIE: THE POWER OF US (劇場版ポケットモンスター みんなの物語, Gekijō-ban Poketto Monsutā Minna no Monogatari, 2018) in the US and Canada and manga publishing rights for Pokémon The Movie: The Power of Us — Zeraora under license from The Pokémon Company International. The 21st feature film of the beloved POKÉMON entertainment franchise caught the attention of fans when it screened in theaters in the US and select international territories last year. POKÉMON THE MOVIE: THE POWER OF US is slated for release on Blu-ray and DVD. Pokémon The Movie: The Power of Us — Zeraora depicts the exciting manga backstory to the movie and features story and artwork by creator Kemon Kawamoto. The manga will be published by VIZ Media this summer. Win DEATH NOTE Live-Action Movie Trilogy on Blu-ray/DVD Combo From Funimation! Funimation is offering SciFi Japan readers a chance to win their new Blu-ray/DVD Combos of the acclaimed live-action films DEATH NOTE (デスノート, Desu Nōto, 2006) and DEATH NOTE: THE LAST NAME (デスノート the Last name, Desu Nōto the Last name, 2006) and the 10th anniversary sequel, DEATH NOTE: Light up the NEW World (デスノート Light up the NEW world, Desu Nōto Light up the NEW world, 2016). SCG Power Rangers LLC and Hasbro. Celebrate the 25-year-old global pop-culture phenomenon and morph into action with POWER RANGERS: SUPER NINJA STEEL: THE COMPLETE SEASON, arriving on DVD, Digital and On Demand February 5 from Lionsgate. The 3-DVD set features all 20 episodes, plus the seasonal specials (including the holiday special Dino Super Charge / Super Ninja Steel crossover episode). It also includes the special 25th-anniversary episode that features the triumphant return of the original Mighty Morphin Green Power Ranger, as well as Legendary Rangers from across time and space! The POWER RANGERS: SUPER NINJA STEEL: THE COMPLETE SEASON DVD will be available for the suggested retail price of $19.98. VIZ Media, LLC, a premier company in the fields of publishing, animation distribution, and global entertainment licensing, announces the release of POKÉMON: BATTLE FRONTIER COMPLETE COLLECTION on January 8th. In the complete collection of POKÉMON: BATTLE FRONTIER, the territory might be familiar, but even Ash and Brock can find more than a few surprises in their home region of Kanto, like a Pokémon Ranger hot on the cases of two Legendary Pokémon! May’s back on the Contest path, blazing a trail to the Kanto Grand Festival, while Ash seeks out the hidden facilities of the Battle Frontier. If finding them wasn’t hard enough, he’s still got battles with the Frontier Brains to deal with — much tougher than any Gym Leader he’s ever faced. The El Rey Network celebrates the holidays with a 4 day marathon featuring 12 Godzilla films plus CLOVERFIELD. El Rey Network is taking over the holidays with the fifth annual “Kaiju Christmas” movie marathon, featuring 96 hours of classic Toho Godzilla films from the Sony Pictures vaults, Sony’s 1998 GODZILLA remake, and the Godzilla-inspired CLOVERFIELD from Bad Robot and Paramount Pictures. The invasion starts with 1992’s GODZILLA VS. MOTHRA on Saturday, December 22nd at 6:00 AM ET.